You’ve done the research, you’ve mind-mapped, you’ve sketched out a million thumbnails, completed a few digital comps, drank 17 cups of coffee, and finally you have arrived. The moment we have all been waiting for is here. You have just realized that your logo concept has truly come to fruition. All of the terrible ideas, obstacles and frustrations from the project are now a thing of the past. All you feel right now is euphoria. Your work here is done. Clock out early, go home, pour yourself a glass of wine and turn on an episode of Family Feud. But, wait! You’re not done! Turn off the TV, turn around, go back to the office, and clock back in. Oh, and the wine, um yeah, drink the wine. Haha. You are forgetting about an integral part of the process. You have worked countless hours, and have come to love your logo like no one else could possibly understand. It is for this reason, friends, that you will be presenting your logo to the client. Now, if you are anything like me, the thought of public speaking brings back memories of choking on words in high school, and cold sweats in college. But we need to move past all of this. We need to stand up and be adults. You have conceived and nurtured this concept, and it is your turn to present it to the world. After all, it is your vision and it is your job to help the world to understand and share it. To do this, we must start with the client. The first thing to do when presenting a new concept to a client is to understand how the client operates. If he or she is relaxed and fun-loving then a laid-back presentation could bode well. 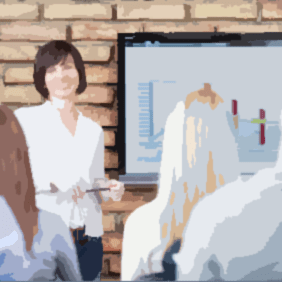 If they are a larger, more traditional company, a formal presentation is most likely necessary. Nothing can make you more nervous then being unprepared for a presentation. Begin by outlining which points you’d like to make in your presentation. Work from there to come up with examples and demonstrations to help your client understand your vision. Thinking back to high school and college, I remember very few details from the presentations I was forced to give or to sit through. However there is one presentation that has stayed locked in my memory. As a sophomore, one of my first design projects was to create a public service announcement campaign poster for the cause of our choice. Some of my peers created posters that revealed the ugly underbelly of drug abuse or expressed the dangers of texting and driving. My poster was a bit different; it was designed to raise awareness to childhood bullying and self-esteem issues in young girls. This message was actually very near and dear to my heart. I made the project very personal, and even included a childhood photograph of myself. When it was my turn to explain my poster to the class, I explained where the idea came from, how it affected me personally, and include excerpts from my childhood. It was very well received. This same storytelling technique will work wonders in your presentation. The reason that this technique works is not only because a story is much more easily remembered than facts and figures, but because of the emotion attached to the excerpt. In John Medina’s Brain Rules, the molecular biologist explains why and how emotion links to our memory. Now that you are convinced that emotion will help you to craft an effective presentation, you are probably wondering how to include such emotion. As I stated before, a story-telling technique can help your client understand your vision and attach a personality to the idea you are presenting. That being said, I’d like to advise against creating a fictitious story. Your client will most likely see right though the phoniness. You are already essentially “selling” them a concept, why make your job more difficult by selling them fake memories? In addition, if your concept is truly well thought out, it shouldn’t be difficult to shape an excerpt that fits your needs. As a matter of fact, some of my best ideas have come from childhood memories. At first, you may think, how on earth do you find emotion in a real estate agency? They sell property, case closed, right? Think about what a real estate agent does specifically. They find people houses. While there doesn’t seem to be anything special about buying and selling houses, I looked a little deeper into the problem. You see, to myself, and to many like myself, a house isn’t just a house. A house can be a home, and a home is something very special. A home is where we rest our heads at night, where we relax and have fun, and most importantly, where we enjoy the company of our loved ones and raise our children. A home is where memories are made and traditions are kept. Once I began to consider this project from an emotional standpoint, instead of an analytical one, the inspiration flowed effortlessly. Think back to the first time you saw the movie Jaws. Do you remember when that eerie music started playing right before Jaws would claim his next victim? Your heart was probably racing, and your mind was flooded with ideas of what frightful event would happen next. You can use anticipation in your presentation to build up excitement for the final product, the logo reveal. During the build-up, you can take your client on the same journey that you took when creating the concept. Help them understand what worked and what didn’t work. Guide them in understanding your train of thought and how you arrived at your final product. Now that you have your client chomping at the bit, anxious to see the logo, you must be certain not to disappoint. There are two ways to avoid a deadpan response here. First is to actually create a great logo. This is a must. Create a logo that you feel good about, and would be proud to call your own. Be sure it fulfills the design brief and is appropriate in every way. The second way is to continue leading your client on the design journey. At this point you need to explain every design decision you’ve made and why. Justify your typography, stylistic choices, and your color pallet. This is important because it helps to reinforce all of the work you put into your concept, and demonstrates why this concept is the best solution to the problem. In design, everything should be intentional. Your client needs to understand that, and this is your opportunity to help them. By speaking knowledgeably about the concept and your design choices, you build authority and exude confidence. In doing this, you increase your chances to be taken seriously, and ultimately convince the client to trust the concept. The worst-case scenario here is, of course, that all of your hard work went to waste. That you have come up with the prefect concept, put your heart and soul into it, and your client rejects it. The correct reaction here is to remain calm and listen. It is at this point where you should allow your client to voice any concerns they may have, and contemplate them carefully. If they have value, take them into consideration. If they don’t, reiterate points from your presentation to help put the client at ease. Do not argue; that will only make either party more headstrong. The best action to take here is to work through the problem together. Stay positive and open-minded, and your client is likely to reciprocate. If push comes to shove, remind the client that you are the designer for a reason. State reasons or cite articles to help your case. If your design is solid, you should have no problem defending it through and through. Ultimately, if done right, the client will see your vision. If not, it may be time to walk away. Often, after you present a logo, the client is on the fence about the design. One of the best ways to help sway them in the right direction is to demonstrate practical applications of the logo. Show them how the logo would work on a hat, packaging, a business card, or whatever would be appropriate to the industry. You don’t need to create exactly what the other collateral will look like at this point, you really just need to help the client understand your vision. At the very least, providing practical applications of the logo will demonstrate that the concept was very well thought out. Although this process has worked very well for me in the past, it is important to understand that every client and every project is unique. There is no one-size-fits-all answer here. However, using these tips as guidelines, I am confident that your next presentation will be a huge success!